One day, he’s tracked down by a man he’s never met—a man his mother claimed was dangerous. The man tells him an impossible secret: Magnus is the son of a Norse god. The Viking myths are true. The gods of Asgard are preparing for war. Trolls, giants and worse monsters are stirring for doomsday. To prevent Ragnarok, Magnus must search the Nine Worlds for a weapon that has been lost for thousands of years. I'd read thirteen Rick Riordan novels before I even started The Sword of Summer, and never once did I feel like he let me down in his storytelling. The count has now gone up to fourteen, because I enjoyed this one! It might not be Riordan's job to write stories that I love, but it may as well be, considering that each story he's added to the list of his published work has found a place among my favorites. To be sure, his stories are primarily geared towards readers on the younger side of the spectrum. But the humor and heart with which he writes these tales is universally understood by people of all ages, and I count myself lucky to be a part of his fandom. The Sword of Summer follows Riordan's patented winning formula: a lovable main character who happens to be directly related to a mythological god + a life-changing moment + quest to prevent the apocalypse/end of the world/death and destruction. You might be wondering: what makes it stand out? I'm here to tell you that there are two things that make this story different from the ones before it: the mythology and the characters. Riordan has tackled Greek, Egyptian and Roman mythology, so it was exciting to hear that he was going to turn his sights on Norse mythology for The Sword of Summer. I'm not nearly as familiar with the gods and concepts, but I never felt extremely lost while reading. (In fact, I found myself yearning to study Norse mythology for myself, just to enhance my future reading experience with this series.) As always, Riordan demonstrates a mastery of the basic tenets of the mythology. It's woven so well into the fabric of this novel; gods are personified, and concepts are tweaked to make sense in the context of our modern society. I definitely feel like I walked away with just a bit more knowledge of Norse mythology, and a curiosity about it that I might just have to satisfy before I pick up the next one. It's quite fascinating to read something that proves to be both entertaining and educational! But Riordan really shines when it comes to his characters. Magnus Chase is different from Percy, Jason, Sadie and Carter. He's older (16! ), and his real life hasn't been great since his mother died and he became a homeless teen. Still, he shares a few similarities with the rest: his lack of preparation or knowledge of how the supernatural happens to be a part of his life; he also extremely loyal, always willing to fight for the people he cares about no matter what the cost, another patented Riordan hero quality. But he's more easygoing and quicker to understand the "lay of the land". Plus, he's got this brand of sarcastic humor that I just love (mostly because it reminds me of my husband). 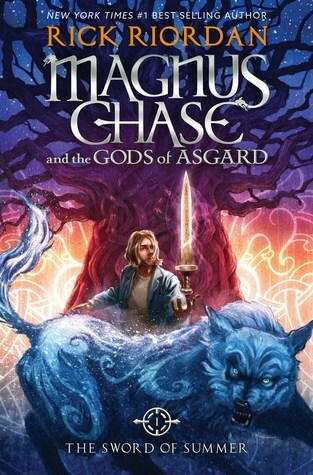 He's joined on his mission by his friends Sam (a former Valkyrie who also happens to be a badass demigod fighter), Blitz (a dwarf with impeccable fashion sense) and Hearth (a deaf and mute elf); he meets the gods and other demigods along the way; he also encounters a familiar face, his cousin Annabeth Chase(!). Really, Riordan excels at writing ensemble casts, and The Sword of Summer is no exception to that rule. The Sword of Summer is fast-paced and filled with enough excitement to keep you turning the pages until you reach the very end. I honestly had no idea what to expect, and it definitely made this reading experience even more fun! (This is also the reason I don't want to get into specifics about the plot.) It also is a funny story, filled with wisecracks, sarcastic retorts and clever chapter headings that made me laugh out loud. As always, it was a real treat to spend time with a Rick Riordan novel, and I can't wait for more! I loved this book too! Riordan never lets me down either. Also, the chapter titles! I can't handle them. They are so funny. Loved reading your review of Magnus Chase Alexa! I felt the same way reading this book. I'm just terrible of putting words together. I'm so excited for Thor's Hammer & Trials of Apollo next year! Haven't read this book yet, but I had read all Riordan's other books and loved them! I also don't know much about Norse mythology (except for Odin, Thor and Loki thanks to Marvel) so I'm really excited to learn more about them in this book. Your review makes me want to read this even more, so thanks for sharing!